This site contains products for sale in the Employee Retention Tools section as well as lots of free articles that may be found in the Articles section. Read the best practices of successful employers. You can Ask the Experts for advice and finally, there are links to articles about employee retention on other sites. This is the most complete listing of articles about Employee Retention in the world! Employee retention is most critical issue facing corporate leaders as a result of the shortage of skilled labor, economic growth and employee turnover. This site explores all aspects of the workforce stability issue in the face of unprecedented churning in the employment market with a focus on retaining your employees. This is one of the hottest topics for corporate leaders in all fields in the United States and globally. Struggling with uncontrolled turnover? We can help. Designed to provide employers--executives, managers, and human resource professionals--with a wide range of tools to control employee turnover, this site offers a wide range of products and services to help you to build retain your most valuable players... and profit. Workforce stability can be your competitive advantage in these turbulent times. Our founder Roger Herman was recognized as a pioneer, having written the first management book on the topic (Keeping Good People) and Joyce Gioia, his partner and co-author in this important work. Today's labor force is different. Supervisors must take responsibility for their own employee retention. If they don't, they could be left without enough good employees. A wise employer will learn how to attract and keep good employees, because in the long run, this workforce will make or break a company's reputation. What's Different? New supervisors must be prepared to be collaborative, supportive, and nurturing of their people. The old style of "my-way-or-the-highway" style of management is a thing of the past. Most new supervisors need training to understand what it really takes to retain employees. Employee retention involves being sensitive to people's needs and demonstrating the various strategies in the six families detailed in Roger Herman's classic book on employee retention, Keeping Good People. Employee retention takes effort, energy, and resources...and the results are worth it. 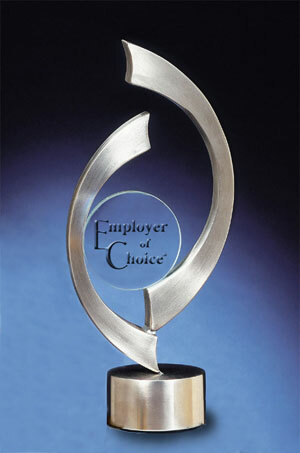 Recently, we've seen a strong resurgence in interest by employers for being recognized as an Employer of Choice®. Celebrate your employee-centered corporate culture! This coveted award is well worth the effort, yet is not easy to achieve. Download the extensive application at the Employer of Choice® website; or for the Word® version, drop a note to Joyce(at)EmployerOfChoice.com or call Joyce at 336.210.3548. To read more visit the website. You know that turnover costs you a lot. Constant churning in the workforce is a major problem today. Here's a book that's packed with low- and no-cost solutions. Within its easy-to-read pages you'll find almost 200 practical strategies for retaining your employees. Published in four languages. New edition. Featured by two book clubs and the Institute for Management Studies. #5 Best Seller for Society for Human Resource Management. This site is one of several websites managed by The Herman Group, a firm of Certified Management Consultants specializing in workforce and workforce issues. Founded in 1980, by Roger Herman, known as "The Father of Employee Retention," the firm serves corporate clients throughout the United States and in other countries. The Herman Group is a firm of Strategic Business Futurists concentrating on workforce and workplace issues. We forecast the future and advise clients regarding relevant trends and how those trends may affect their lives. Applying our expertise as Certified Management Consultants, we advise corporate leaders regarding employee retention and organizational development to help them build workforce stability. We help organizations become Employers of Choice�. We also work with Employer of Choice, Inc. to formally recognize employers that meet the stringent standards dictated by the labor marketplace. As authors of management books and as active professional speakers, we inform and inspire people to make a positive difference in the world of work.